So after a conversation on IRC where the general gist was that apache was bloated and slow vs. lighttpd, I thought I’d try a little experiment today – see how long it might take to compile up Apache, PHP and MySQL and get it going on a Raspberry Pi… Then stick a wordpress on it. So I decided to compile them from sources – which is what I often do anyway rather then use the Debian supplied versions – mostly to see how long it would take doing it that way, but also to try to only compile in the modules/features, etc. that I needed – hopefully to make it as “lean” as possible while still maintaining enough functionality to run WordPress. My Pi was running Raspbian with a 3.2.21 kernel, and the memory split at 244MB. Versions of the “AMP” stack are: Apache: 2.2.22, MySQL: 5.1.61 and PHP: 5.3.10. Watching the system with ‘top’ while it was compiling, it seems the GCC compiler doesn’t really need much more than 60-80MB of RAM, so the few little things that got swapped out are really just making more buffer space – so I imagine the compiler and associated programs stay cached in RAM for the duration while will speed things up somewhat. The bottleneck really seems to be the CPU, so I doubt putting the files on USB drive, NFS, etc. would make any difference to it all – the system runs at >95% CPU running gcc for a good few minutes for each file, so optimising the few seconds of disk IO doesn’t really seem worthwhile. … Some time later and it’s running. Next week (if I have the time and enthusiasm!) I’ll start to try some of the newer servers and configurations and so on… Watch this space, but don’t hold your breath! Just uploaded a new version of wiringPi with a few bug fixes. the main one being in digitalWrite when the range check for the pin number was fine when it was wiringPi pins, but not fine for the newly introduced GPIO pin numbers. I’ve also added in some additions – a shiftIn/Out module and a serial port access module. These are just handy additions, but I use them myself in other projects, so it’s a handy place to keep them. Raspberry Pi – Game Port IO? Some sort of reaction tester? shooter? Will crank up my imagination and see what comes up, but suggestions are welcome! Working on some fun projects and examples with the Raspberry Pi’s on-board GPIO ports and the SK Pang Starter kit. Just a note to say that I’ve updated my WiringPi libraries. It now should work fine with C++ programs and there is an added function (and flag to the gpio program) to switch fron the WiringPi Arudino-like pin numbering to the native BCM_GPIO pin numbering. More when I can get more time out of the kitchen… Lost count of the number of scones but I think it’s close to 200. 8 big cakes (Lemon Drizzle, Chocolate, Victoria sandwich and coffee & walnut), 100 mini cup-cakes, and 240 slices of bread into dainty sandwiches! If only the weather was looking better… Ah well, we do have an indoor hall as well as a big garden! — Quick update after the event. A huge success with most of the food eaten! If you want photos, they’re over on our Moorbakes site. To use the GPIO pins on the Raspberry Pi, I have written my own access library and modeled it on the Arduino Wiring system. It started life as the means to allow my BASIC to access the GPIO pins, but I’ve now tidied it up and released it as a library in its own right. Friday saw me on a train to Manchester to attend the 2012 UCubed Unconference and what a great time it was too. I went just because I could! 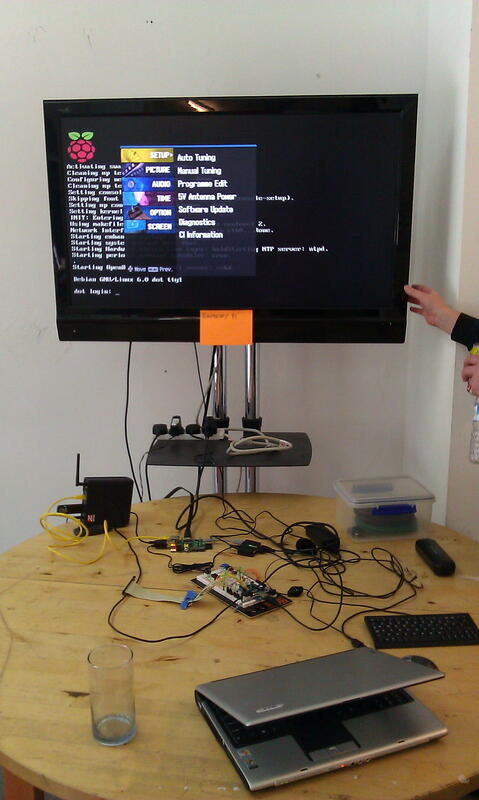 But I also had my Raspberry Pi to demo as well as showing my BASIC interpreter running on it along with all the other stuff that comes with it – The Debian install and LXDE desktop. 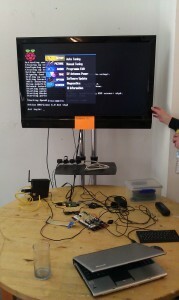 It generated a lot of interest indeed! It generated so much interest, that I barely had time to see and talk to more people! However I did attend the talk given by Alan O’Donohoe and on my way to the station, Alan put me on the spot for a quick audio-boo on IRC! Another chap who caught my eye was Julian Skidmore of the Fignition project. Pretty amazing stuff – he has an Atmel 8-bit chip (same as Arduino chip), displaying video entirely in software and it runs a variant of FIG Forth. The venue for the event was Manchesters MadLab a pretty fantastic place! Thanks to Alan, Les and the others for organising it. It certainly made a nice change from sleepy Devon! Here we go! My Raspberry Pi has arrived and I’ve been having some fun. First job was to secure the additional bits and pieces for it – USB keyboard, mouse, powered hub and (still on order!) HDMI to DVI adapter. First impressions? It’s small – but then again, so is the main-board inside your average mobile phone which these days is actually more powerful than the Raspberry Pi, so I really shouldn’t be surprised! First task was to boot it up – I’d already prepared a 4GB SD card with the latest Debian image on the Raspberry Pi website. I plugged it all together and before long (really, 5 seconds) it was booting up. Part of their boot-up sequence involves a reboot, but that only too a few more seconds and it was there. Login with the published details and that was that. One more Linux box to my collection!